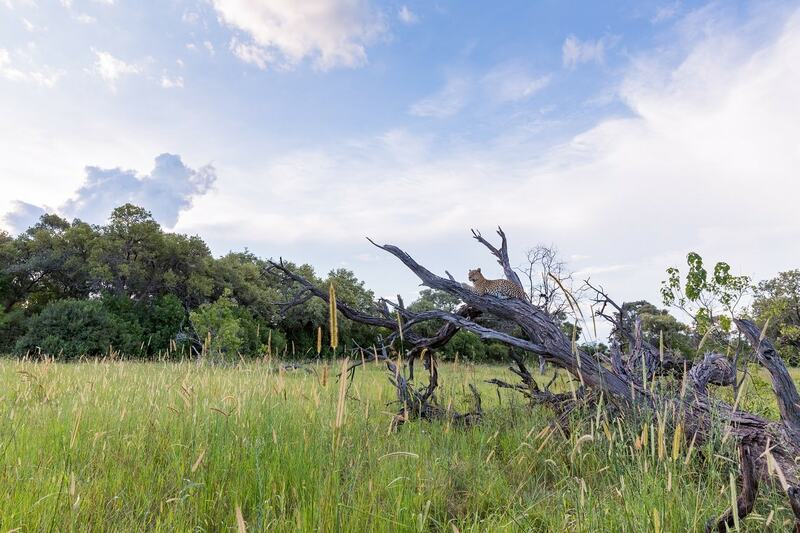 After spending six days in Botswana and exploring three of the country’s most impressive wilderness destinations – Moremi, Savuti and Khwai – T4A traveller Harriet Nimmo says the trio of reserves make for some seriously adventurous road tripping. It was March and the rains had been unseasonably late. With a lot of water pooling around, our trusty 1999 Toyota Hilux had to brave some cautious water crossings and back-track more than once. Lush green vegetation and majestic cloud formations more than made up for this. 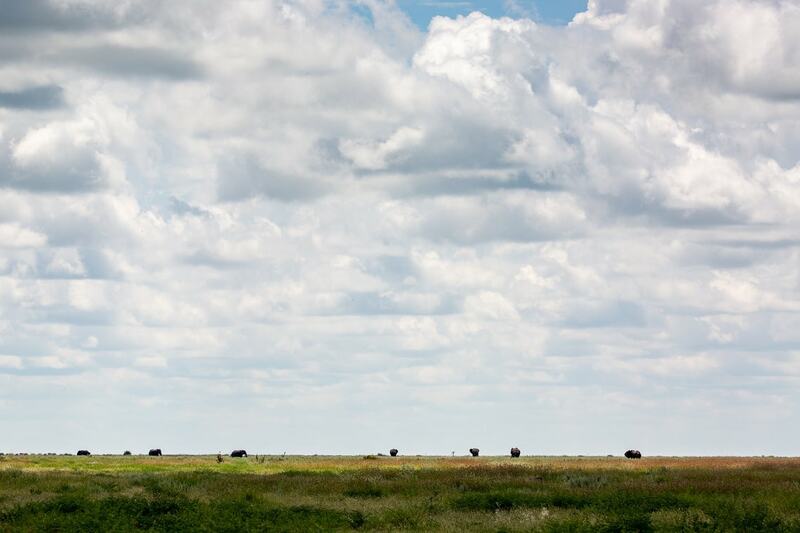 Exploring Botswana’s wilds was just what we needed to recharge our batteries and memory banks. En route, we spent a night in Maun stocking up on food, drinks and fuel. Since our last visit, two great new eateries have opened up: The Tshilli Farmstall and Marc’s Eatery. 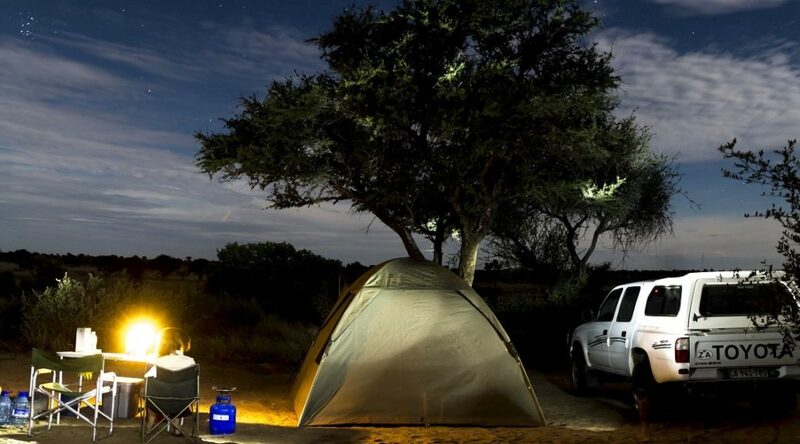 Before leaving Maun, make sure you have your national park campsite bookings and park permits – you cannot stay in the parks without a booking. Also, it’s advisable to book campsites as far in advance as possible, especially if travelling in the peak dry season. First stop was Moremi Game Reserve – following the tar road to Shorobe, then through the buffalo fence, forking left onto a sandy track. Initially travelling through many a miombo forest, the drive might seem mundane, but the sudden appearance of an elephant directly in front us got our hearts going. We cheered as we entered through South Gate. A further 60km on, we finally reached Third Bridge, crossing the rickety wooden pole bridge. This is our favourite campsite in Moremi. It borders the Delta and we’ve always been lucky with sightings. All night long the lions roared and lying in our tent, we counted our lucky stars to be back in Botswana. As soon as dawn broke, we jumped in the car to try and find the cats. It was a magical and misty morning. 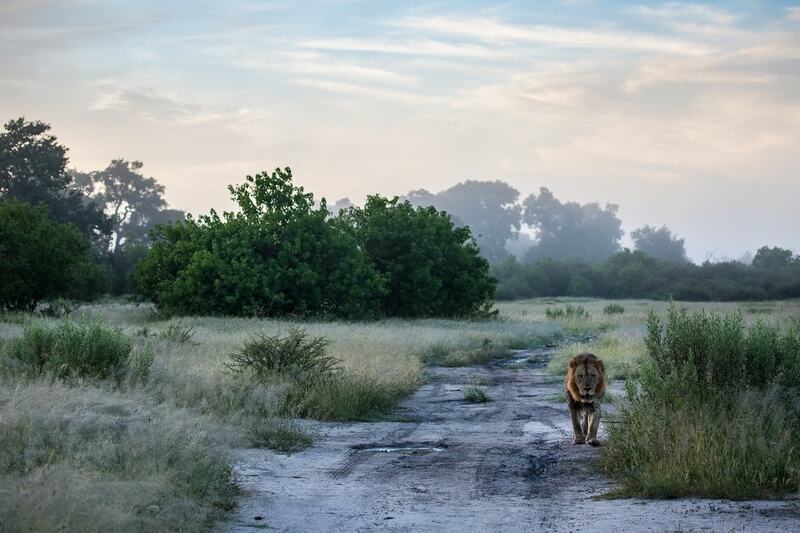 Somehow, we managed to stumble on three majestic male lions walking towards us. We followed them for more than an hour, our ribs rattling as they continued to roar, their breath crystalising in the dewy morning. Next stop was Khwai, exiting Moremi at North Gate. This proved a long and tortuous journey due to the amount of flood water – we often had to back-track and try and navigate our way round the flooded areas. I must confess, we were very glad to finally reach North Gate. Khwai is not a national park but is owned by the local community. The camping here is much more basic than Moremi as there are no facilities – you have to bring all your own water and a spade. But Magotho Campsite is stunningly beautiful, with the pitches apart from each other, and being close to the Khwai River, hippos serenade you at night. 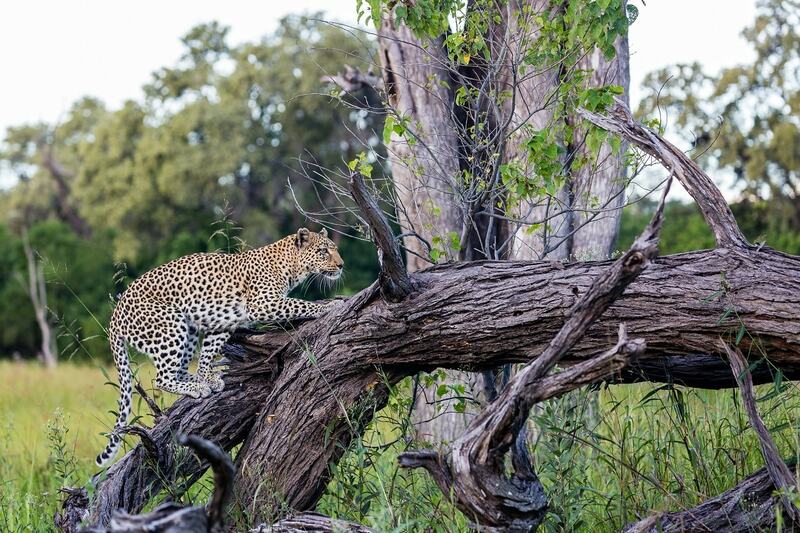 Thanks to a game-drive vehicle, we had a spectacular leopard sighting in the afternoon. How the guide saw the tip of her tail in the grass, we will never know. We were privileged to follow the leopard walking through the long grass and climbing onto logs for better views – oblivious to our vehicle. Like Moremi, Khwai was water-logged and after bumping along muddy tracks for two days, we were dismayed to discover that we’d lost our spare tyre from under the car. It must have got wrenched off on one of the worst bumps. Crisis! We followed our T4A tracks trying to retrace our steps. Hallelujah, some friendly South Africans had not only spotted our wheel, but had propped it up on the side of the road. They very kindly led us back to the exact spot. Beers and cheers all round. Our final destination was Savuti. From Khwai, this involves a sandy track to Mababe Gate after travelling north on the muddy swamp road to Savuti Camp. 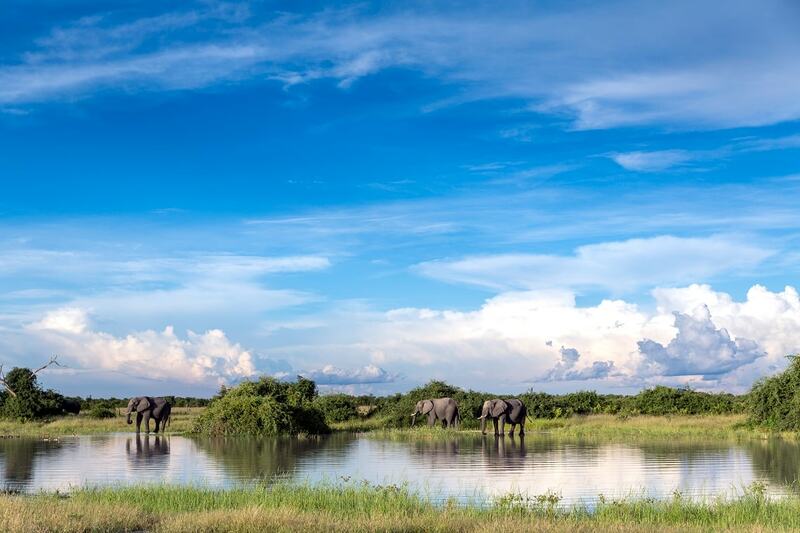 Although situated inside Chobe National Park, Savuti is very different from the Chobe riverfront area. We had previously been to Savuti only in the dry season and it was astonishing to see the difference during wet season. 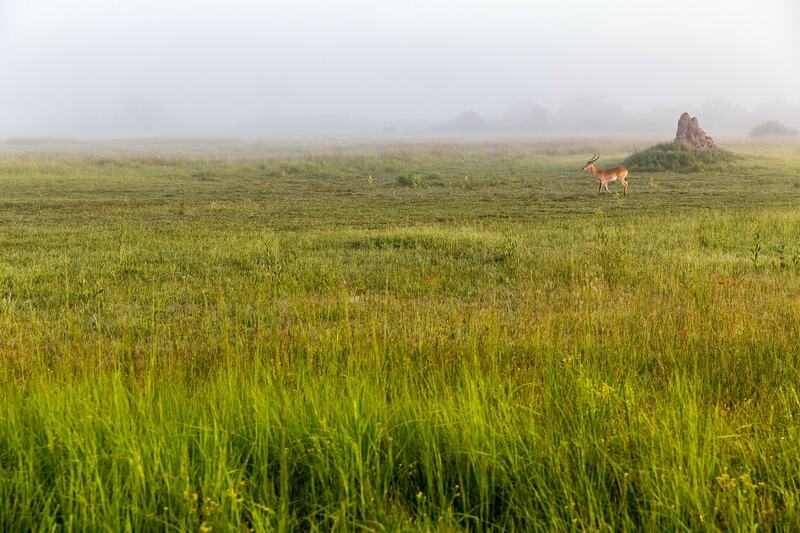 The plains were teeming with game, like a veritable Eden, and there were waterbirds and raptors everywhere. Savuti is famed for its large prides of lions. However, on our two-day stay, we had no luck with predators – other than the obligatory hyenas ram-raiding the public campsite at night. Despite seeing no cats, we had one of our most photogenic elephant encounters ever. In that magical afternoon golden hour, we watched entranced as a breeding herd of ellies came to drink at a waterhole, perfectly mirrored in the glassy water. Very happy photographer husband, Mike. After two nights at Savuti, we set off for the long slog south back to Maun, about eight hours of dodging puddles and rutted hollows. Amazing how just six nights of wild camping replenishes the soul. Our beloved Botswana trio will always remain a treasured memory. Great summary, loved the piece! Reminiscing right now as I had very similar experiences and sightings in the Khwai Concession last September. Water levels then were Goldilocks conditions (not too low, not to deep – just right in other words). What time time of the year were you there?